Guns: John Hostettler from Indiana lost in 2006, two years after he tried boarding a D.C.-bound plane with a loaded 9-mm. Glock in his carry-on. Texas’s Steve Stockman wrote in Guns & Ammo that Waco was a government conspiracy. (He lasted one term.) Idaho’s Helen Chenoweth, the Sarah Palin of her day—she held endangered-sockeye-salmon fund-raising bakes—said in a Times interview that federal helicopters were hovering over Idaho. (She also said she favored the Confederacy, explaining that it was “a states’-rights issue”—so maybe she was also a proto Rand Paul?) She was good enough to honor her term-limit pledge and stepped down in 2000. Gals (mostly): Oregon’s Jim Bunn, who ran with the enthusiastic support of the Christian Coalition, almost immediately dumped his wife—with whom he had five children—and married his 31-year-old chief of staff. (The voters, in turn, dumped him, and he became a corrections officer.) 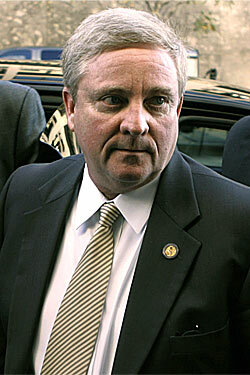 Indiana’s Mark Souder, a huge promoter of abstinence education, just resigned over an affair with a part-time aide. Florida’s Mark Foley, who chaired the House Caucus on Missing and Exploited Children, had to resign in 2006 because he sent salacious IMs to male pages. In 2009, it came out that Nevada’s John Ensign, now in the Senate, had an affair with the wife of his top aide, then arranged for his parents to make a “gift” to the couple of $96,000. The wife of Ohio’s Steve LaTourette accused him of having an affair in 2003 with a lobbyist (whom he later married). And Mark Sanford … Well, we all know what happened to him. Greed: Ohio’s Bob Ney, once known as the “Mayor of Capitol Hill,” became known as “Representative No. 1” during the Jack Abramoff affair, which led to his pleading guilty to conspiracy and making false statements. (He resigned in 2006, then spent seventeen months in jail.) Utah’s Enid Greene Waldholtz decided not to run again in 1996 after her husband, who’d claimed he was rich, confessed to a check-kiting scheme to fund her campaign and their fabulous lifestyle (they even ran up $45,000 on a staffer’s credit card). Illinois’s Jerry Weller announced his retirement in 2007, just as the Chicago Tribune was looking into possible unreported land holdings in Nicaragua. Good lord: Dave Weldon, a Florida doctor who retired in 2008, dragged Congress into the case of Terri Schiavo; North Carolina’s Sue Myrick, still in office, wrote the foreword to Muslim Mafia: Inside the Secret Underworld That’s Conspiring to Islamize America. And Andrea Seastrand will be remembered for suggesting that old military bases be converted into commercial space ports: “Think of all those poor children trapped in the ghettos. They may want to take a trip into space someday, or even go live there.” The voters strapped her to a rocket after just one term.